Abundant rain has brought the garden back to life. 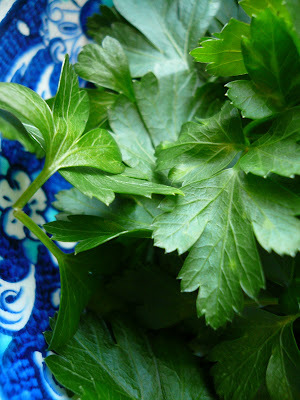 Parsley, picked when the sun broke through, for a fennel and walnut filo pastry pie. The handpainted bowl, a gift from the Artist's ex-wife's holiday in Turkey. Rosemary is something of a challenge in a vegetarian kitchen. Strongly flavoured, it all too often overpowers subtler ingredients. Rosemary demands your full attention. Her camphor-laced flavour is bitter when used excessively so a considered, disciplined hand is required. While a fleeting hint is delicious, a wallop of the stuff will leave you feeling like you’ve eaten a handful of mothballs. But she has much to offer. 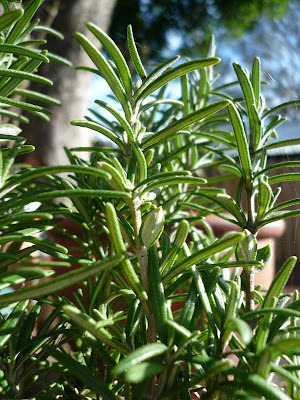 Ancient Greek scholars wore rosemary to improve the memory, their necks garlanded with her long branches. Almost universally she symbolizes remembrance and, of all things, love. 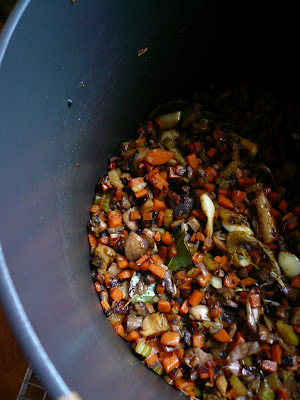 An Hungarian friend once returned from a wedding bearing a healthy sprig. ‘If it grows’, she declared, ‘your true love will find you within twelve months’. Romantic stuff. Though it was duly planted, sadly to no avail, I am not one to give up on such fancies quite so easily. Potatoes, peeled or not, and roasted with whole cloves of garlic and a few healthy sprigs of rosemary are divine; chunks of vegetables skewered onto long stalks, stripped of all but the paintbrush-like tips make great barbeque fare in the warmer months. But, down here at least, winter has firmly taken hold. The meal (of which this sauce was a part) is too long and complicated to write up in these pages, suffice to say it took all afternoon and much of the early evening. 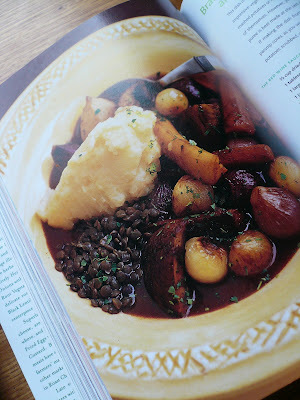 Braised root vegetables (whole shallots, carrots, parsnips and big, earthy mushrooms), a swede and potato mash (made creamy with a spoonful of mascarpone) and perfectly tender Puy lentils, held together by this sauce. Enough to make you swoon. Enough to make you pat yourself on the back and marvel at your own culinary genius. We ate silently, slurpingly, appreciatively. So comforting and good is this sauce that it should prove, once and for all, to anyone doubting the virtues of a meat-free life that vegetarian fare can and does deeply, deeply satisfy. Place the porcini in a bowl and cover with 1 litre of freshly boiled water. Set aside. Heat the oil in a large soup pot or Dutch oven. Add the vegetables, garlic and herbs. Cook over a medium-high heat, stirring only occasionally, until the vegetables are well browned. This should take you about 20 minutes. Add 1 teaspoon of sea salt to the pot. Stir in the tomato paste and flour, letting it cook for a minute or two to take the ‘rawness’ off the flour. Add the wine, scraping the bottom of the pot to release any caramelized bits and then pour in the porcini and their soaking liquor. Bring to the boil, then lower the heat, cover with a lid and gently simmer for 45 minutes. Strain through a colander into a large saucepan, pressing down on the vegetables with the back of a spoon to extract as much liquid as possible. Return the strained sauce to the heat and gently simmer for 15 minutes. Add the tamari and taste for seasoning (it will be pretty damn good, so you won’t need more than a touch of pepper). Whisk in the butter, if you are using it, just before serving. Double the recipe and freeze it in 1 cup measurements for fast mid-week cooking. The possibilities are limited only by your imagination; a shepherd’s pie of tender lentils, drained and mixed with 1 cup of sauce and topped with fluffy mash will make an easy mid-week meal. But don’t stop there. Some big mushrooms, sliced thickly, pan-fried until juicy and finished in a ½ a cup of the sauce make the most beautiful topping for toast mid-winter. This post is being submitted to Kalyn Denny, creator and host of this weeks Weekend Herb Blogging. Mache, Lambs Lettuce, Corn Salad, call it what you will. Dressed with fresh mandarin juice and a drop or two of pine nut oil. Never seen it before. Delicate and rather pretty. Best served on a wide, flat plate. Cake baking ain’t a strength I'm afraid to say. Not that I don’t love reading about baking or, better still, eating baked goods, it’s just that I never seem to be able to achieve the results I crave. Too impatient methinks. When Wendy recently posted a call for easy, no fail cake recipes, I knew exactly how she felt. So this recipe, adapted from one in ‘The Perfect Cookbook’ by David Herbert, is just the kind of thing for me – no need to lug out the Kitchenaid; no need to wait for butter to soften (no microwave in this little kitchen) and, best of all, not a lot to wash up afterwards. ‘Stress-free’ cake making, just as Mr H. suggests. And the step-sons love it. 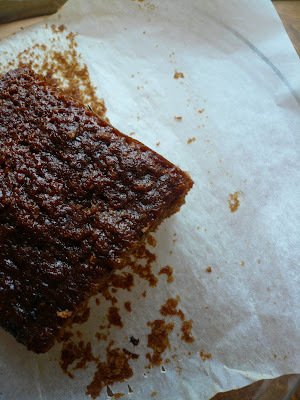 Cinnamon and ginger cake This is quick to make and best eaten within a day or two. Don’t find that it usually lasts that long, especially if you make the gingery syrup to soak the cake that is suggested below. Preheat the oven to 170 C (325 F). Grease and line the base of a loaf tin with baking paper. 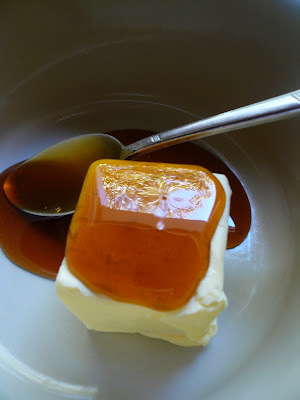 Melt the butter and golden syrup together in a small saucepan over a low heat. Cool. Sift the flour, bi-carb soda, baking powder and spices into a bowl. Stir in the sugar. Pour in the milk, followed by the egg and mix well with a fork. Gradually add the melted butter and golden syrup, stirring until well combined. Pour into your prepared loaf tin and bake for 50-55 minutes, or until a skewer inserted into the centre of the cake comes away clean. Cool in the tin and dust with icing sugar if you like. 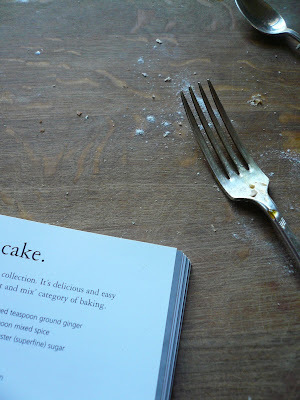 A syrup to make it something special: This is lovely as is, a sort of simple, fragrant afternoon tea cake. But you can smarten it up by making it into a sticky syrup cake. 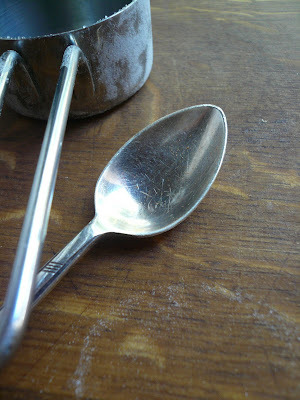 Mr H. suggests placing ½ cup of sugar, ½ cup of water and 1 tablespoon of finely grated fresh ginger in a small saucepan. Bring it to the boil then simmer for 5 minutes. Mr H. says to spoon a little on top of the hot cake when it comes out of the oven. It then becomes dessert. I disagree. Pour the whole lot over the cake and things get even better. Especially when served with this yoghurt - the Greek one with a hint of honey is fantastic stuff. Not much of a baker. But sometimes, cake is just what's needed. Feel like a proper step-mother now. Quick vegetable lunch, to use up the last of the goats cheese. 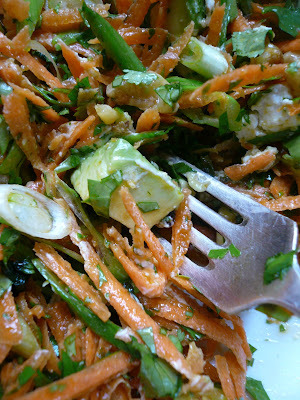 Avocado chunks for creaminess; citrus-laced coriander to cut through. Fog filtering the light this winter morning. 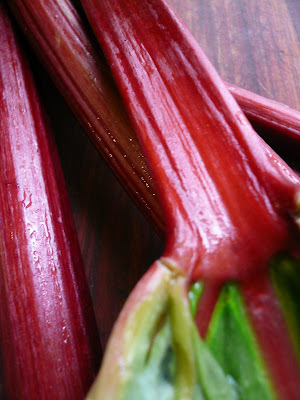 Stalks of rhubarb, beautiful but toxic leaves in tact. 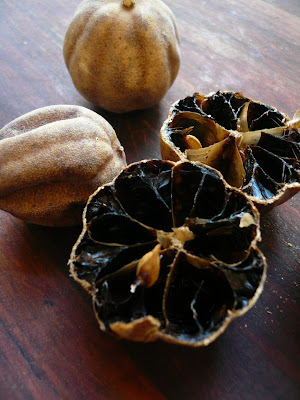 For a compote, scented with a spoonful of rosewater and a pinch of ground ginger. Flecked with tiny black vanilla seeds. Rosa’s cauliflower soup. Rosa’s suggestions for garnishes are absolutely wonderful. The apple and vanilla - yum. Another Outspoken Female’s vegan meal of pumpkin, coriander and chickpeas. The dressing is the best, creamiest, non-dairy thing I’ve tasted in a long, long while. These pita chips, made with Turkish bread. Myriam – yum! Kathryn’s beetroot curry – can’t wait to try this as a way of taming all that sweetness. Johanna’s pierogi – never made them, but really, really want to now. This beautiful salad from Vegan Yum Yum. Almost everything (bar, of course, the meat) from Ceviz’s wonderful blog about Turkish food. These look incredible and so do these. This beautiful quinoa soup from Lisa. And lots more too. So much food...so little time. It’s getting colder. Not quite foot-stampingly so, but with rain deluging coastal areas of Eastern Australia, soup weather finally is upon us. 'Bout time. 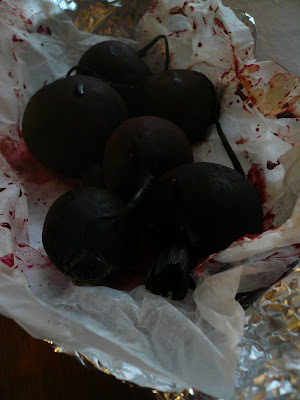 Beetroot is a vegetable too sweet for my liking. I’m not alone here. But it’s a nutritional powerhouse; a blood purifier (as that startling purple-red hue suggests), a powerful detoxifier and a protector of the lungs amongst many other things. So I'm determined to come to grips with it. 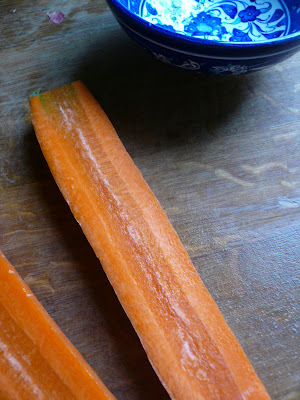 Juiced with a mixture of carrots, celery and ginger, a small glass will set you right in no time at all. And those iron- and beta carotene-rich tops are sweeter than even the smallest, tenderest of baby spinach leaves. 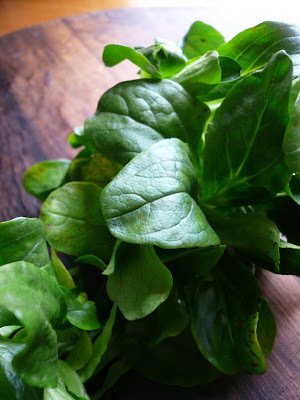 Cook them as you would spinach, washed and wilted in a frying pan until tender and bright green. Borscht, that most famous of beetroot concoctions, unfortunately is relegated to my list of culinary rejects. I loathe its sickly sweetness. Instead, I offer a much more savoury soup, one that crosses a few continents in a Peter Gordon ‘fusion’ kind of way. Though I normally like to steer clear of such confusion, somehow this soup works. Very well. I have Susan B. from Canberra to thank for her intriguing suggestion of ‘layering’ lime flavours – kaffir lime leaf, Iranian dried limes and fresh lime juice – the combination of which cuts through that sweetness with a good, strong hit of sour. On another note entirely, I must thank Stephanie for two things. Firstly for recommending a visit to the Tofu Shop in Richmond – cannot believe I have lived in Melbourne for nigh on six years and never known of its existence – and secondly, and much more importantly, for her excellent article on blogging in The Sunday Life magazine over the weekend. Your mention of Nourish Me made my mum extremely proud. Thank you. 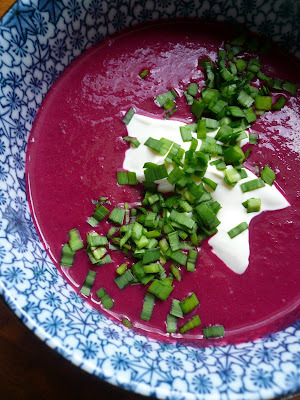 Beetroot, lime and coconut soup – for 2-3 This is a shirt-stainer of a soup, so consider yourself warned. Inspired by a recipe in Leith’s Vegetarian Bible it uses dried lime, a packet of which had been hanging around unopened in the cupboard for way too long. They are by no means essential to this recipe. They will however be back soon – so good is their flavour. Preheat the oven to 200 C (400 F). Lightly scrub the beetroots and trim all but 2 cm (1 inch) of the stalks. Wrap them, unpeeled and whiskery tails in tact, in a decent-sized sheet of baking paper, then wrap this parcel tightly with aluminium foil. Bake in the oven for 1 ½ hours, or until tender all the way through. This can be done hours, even days ahead. When cool enough to handle, trim and discard the stalks and tails, then peel – the skins should come away easily when rubbed with your thumb. Cut into large chunks and set aside. Heat the oil in a saucepan. Add the onion, lemongrass, lime leaves and crumble in the dried lime. Cook over a low heat until softened, about 5 minutes. Add the beetroot chunks and the stock. Bring to the boil, then lower the heat and simmer for 20 minutes. Whiz in a blender. Add the coconut milk and puree until smooth. 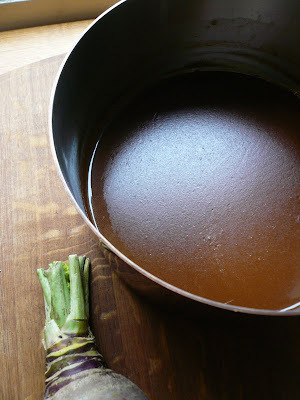 Rinse out the saucepan, return the pureed soup to it and gently reheat. Taste for salt and pepper. Add a little tamari to taste for a deeper flavour and squeeze in the lime juice. Serve with a spoonful of yoghurt and sprinkle the lime zest and chives over the top. 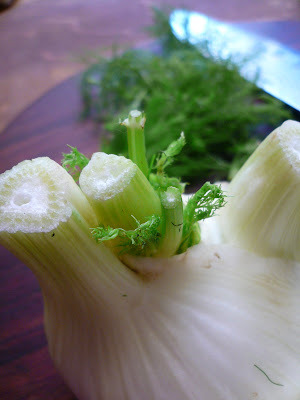 Fennel, for a pasta sauce. Caramelized with onions, garlic, saffron, wine-plumped currants and golden pine nuts. Two huge handfuls of parsley at the end. Rich with grassy olive oil and redolent of warmer days.